"Nantucket Island: Whaling port, Quaker stronghold, a sandy place isolated by a location thirty miles at sea, cut off from the mainland by frequent storms and wars . . . this is the setting in which this unique basket tradition developed" according to Katherine and Edgar Seeler in their book, Nantucket Lightship Baskets. Because the Nantucket Basket was made by a group of people in an isolated community of families closely connected there is uniformity in their construction, not unlike Shaker and Taghkanic Baskets. 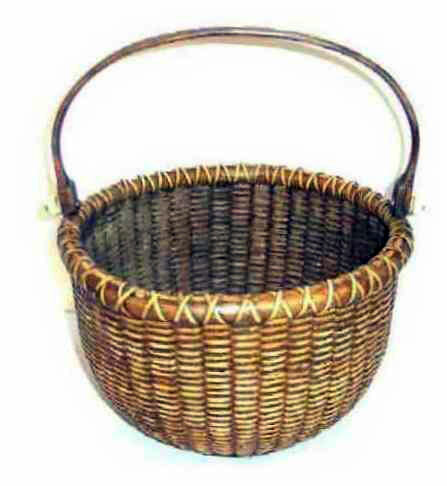 As with all Nantucket Baskets from the third period (1830/40's) forward, the baskets were woven of rattan. This material comes from a climbing vine of the palm family and grows in tropical countries. It is also called "cane" and was used for chair seats and so was readily available to basketmakers as well as from the whaling vessels that plied the Pacific. The second and very important characteristic of a Nantucket Lightship Basket is the use of wooden bottoms. This allowed for the production of a very strong basket. Almost any type of wood that was available was used for these baskets, but usually it was a hard wood. Finally, molds were used in the construction of these baskets. Because of this, greater accuracy regarding size was obtained and nests of baskets could be more easily made. Nantucket Baskets are noted for their homogeneous quality of beauty and workmanship. Beginning with the Lightship era, we see the baskets being made at sea by the men on Lightships, specifically No.1, Nantucket, New South Shoal, which was established twenty-four miles south of Sankaty Light in 1856. On this lightship, ten people lived and took care of the two lights. With nothing to do but clean the sixteen lamps and stand watch, they made baskets, continuing to do what some of them had been doing on land. Each man stayed on board for eight months and in this isolation they produced some of the finest baskets made. It is interesting to note that this basketmaking activity has been compared to the "scrimshawing" activity on the whaling vessels, only on the lightship the scrimshawing meant preparing the strips of rattan for the manufacture of the baskets. Thus the romance of the Lightship Basket continues . . . conjuring up the lonely life of men on a ship anchored on dangerous shoals off Nantucket with nothing to do but tend the light and make baskets day after day. Nantucket Baskets were made in a variety of shapes and sizes, with those having swing handles being most commonly found. This Nantucket Basket is made with rattan weavers that are thin and the basket presents the traditional appearance of the baskets of the latter half of the 19th Century. The two pieces of the rim are laced together with rattan very evenly and no attempt has been made to hide the nails that are used to attach the ribs to the rim. The pine bottom, would have been made by hand. The rim includes a middle strip, between the outside and inside pieces. This serves to cover the rib ends, which are no longer turned over, and it also prevents dirt from getting into the crack between the two rim pieces. Nails are used as well as lacing to keep the rim intact. There is an old varnished finish as is found on most Nantucket Baskets. With its warm, mellow, nut-brown patina, it is in excellent condition with no breaks to the weavers or rim wrap. Many of the men on the Island were or had been whalers at some point in time so it does not surprise us to find the added embellishment of whale ivory knobs at the handle fastenings. It's a wonderful detail not commonly found and sets this basket apart from the others. Wonderful! The basket is slightly out of round with the size being 8-1/4" or 8-1/2" in diameter, depending upon where measured, due to shrinkage over time and it stands 5'1/4" tall, not including the carved wooden handle.